Series devoted to saving treasured heirlooms from the scrapheap. 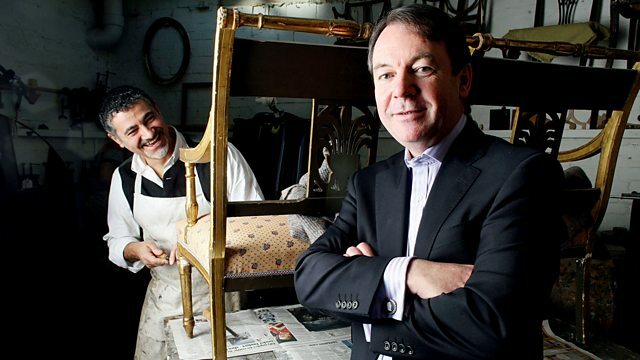 In Stonyhurst College, Lancashire, furniture restorer Tim Akers revives some 300-year-old battle-scarred chairs. and maybe make you some money at auction. I'm at Stonyhurst College, a splendid Grade I listed building here in rural Lancashire. it was bequeathed to the Jesuits, and is now one of the country's top boarding schools. and our team of restorers are already attracting a lot of interest. Your rocking horse is just one step away from the knacker's yard, isn't it? And the questions on everyone's lips: just how much are they worth? I'm suggesting that it may be in the £4,000 bracket. -Would you like to go ahead with that? -I would, yes, because I really like it. And will they make any money at auction, or end up back at home? Coming up on today's programme - a mysterious Flemish woman hiding under layers of grime. Can painting conservator Lucia reveal her secrets? This dirt is really quite telling. What hope is there for these fabulous 300-year-old battle-scarred chairs? I'm a pot-aholic. I love this vase! Come on, Roger, we need your ceramics skills to bring it back to life. It's worth good money, but not like this. To restore Moorcroft is quite difficult. So can he restore it and make this vase fly at auction? £800? 850? I'll take 850. It's wonderful to be at Stonyhurst College for today's Restoration Roadshow. the roll-call of past pupils is a who's who of the great and the good. celebrated author and creator of Sherlock Holmes, also left his mark. While our restorers investigate the day's first casualties, this item's caught my eye. Owned by Dr Frank Rudman and his wife, Liz, and it's linked to the great author himself. The connection of Conan Doyle with Stonyhurst is quite interesting. -with two characters called Moriarty and Watson. And you've brought along a a couple of volumes... What are we looking at? We're looking at bound editions of the Strand Magazine. The first, 1891, possibly the most interesting. I was led to believe that these originally were offered in, was it the monthly editions? In covered magazine form, that's right. This was subsequently bound so there's the edition for the whole year there, 1891.
these bound Strand magazines are highly prized. They're in pretty good nick, too, so I think tampering with them would be a crime. But what an unexpected treat. It's this unpredictability that our restorers just love. What's going to turn up next? What secrets does each treasure hide? Like Edwin Grettin's mysterious oil painting. who spent 12 years at London's Victoria and Albert Museum working on priceless masterpieces. What a beautiful portrait you've brought in for us today. in Poland and I saw her in a junk-shop, and I liked the look of her. She didn't cost me very much. I paid about £25 for her at the time. She's beautiful. She looks Flemish to me. Probably late 17th century, and she's oil on panel. is that somebody's actually had a little wipe of the surface here. You have got this sort of streak down here. That's actually taken some of the discoloured varnish off. -We have also got some paint losses around the edges. -A nail's gone through there, probably when it was in its original frame, so that's nail damage. is in the hands, and these two hands are painted very differently. This looks as if it's actually been added on at a later date, but that's not a problem. It adds to the history of it. in the paint there, is this area here. It's been heat damaged, and you can see that the paint in this area is bubbled up. Are you thinking about selling it? Have you had an evaluation? No, I haven't recently, no. If it turns out to be very special, very valuable, I don't think I would want to hang on to it. I would want to sell it. If it's enough to buy me a chateau in France, I would certainly sell it! I don't think somehow it's going to do that. it will probably fetch something up to £1,000. is some local consolidation of this very fine, flaking paint here, then surface clean it. Take all the dirt off the surface. Not touching the varnish that's under there, that's a different thing altogether. -you'll get a much better idea of the image, and refit it into this frame. Would be around about £200. It looks like Edwin's enigmatic lady has had a tough old life. Under Lucia's care, what will come to light from beneath those ancient layers of grime? Could this woman prove to be Edwin's lady luck? Restorers just love getting their hands on items largely untouched since they were first made. Even if that was over 300 years ago. These fabulous chairs were brought in by Chris and Joanne. bringing back beauty to neglected and abused furniture. It's a passion he's been indulging for over 30 years. So, Chris, how lovely to have some early oak. Can you tell me anything about them? Yes, they've been in my family for many generations now. ancestral home, and have been in our family home ever since. I think they're fantastic, I really do. I really love them. There's a lot of Victorian copies around. -Do you know the date? -I wouldn't like to guess. That's fine. That needs to be removed. but of course, these joints were never originally glued in the first place. They were all dry assembled, and pegged, and you can see the lovely pegs on the chairs. The other thing is, of course, the second chair has got replacement finials. so I will turn two new ones, age them down. But the big question is, Tim, how much will they cost to fix? Sounds like quite a big job to me. to get them into that sort of condition. So, what are you going to do? Do you think that's worth spending the money on the restoration? I would say on balance that it probably would be. You know, you are looking at a niche market, and I think fully restored, you might get the best price. Hold on a minute! Who's the expert here? But I actually think Chris is right. I reckon these chairs are worth £1,000 of anyone's money. at the right auction and with a fair wind, they could reach up to £1,500. Coming up - as Tim starts work on the chairs, he discovers a surprising feature. That's a piece of linen! That's 17th-century bodging at its best! And despite being hidden in the middle of the Ribble Valley, another famous name has found his way here. Stonyhurst College is beginning to look like an antiques A&E department. Bruised and battered pieces lie everywhere, with owners waiting to see if they can be rescued. Sue Ashcroft is hoping for a minor miracle. I'm really rooting for Roger, our ceramics restorer. If he can get this right, Sue could make pots of money. of the country's leading experts in pottery and porcelain restoration. Tell me the history of this. Where's this been hiding all these years? For the last seven years, it's been hiding in my garage. and I was sorting things out, there was a little note inside that said, "Don't just throw this out, love." Oh, really? Is that because she knew the value of it? -She had some idea it's a nice piece. Yes, yes and she also knew that I would just get rid of it. It isn't... I can see that it's beautiful, but it isn't my taste. -It's not your sort of thing. There's no point it living in the garage, is there? suggests that it is after 1900, and so it's around 1905, give or take. What a find. And hey, can you believe it? Dumped in a garage! So you have no idea of what its value might have been? -If it had been perfect, it would certainly have been around the £1,000 mark, or even more. Like this, if it went into auction like this, it wouldn't fetch very much. It might be just a few hundred pounds. All the brushwork round here, very, very difficult for the restorer to put back. So the cost of restoration of something like this would certainly easily be around £350, £400. -What do you think about that? Do you think that's a worthwhile option for you? I thought it might have been about 300, something like that. So you're happy to go ahead on that basis? Are you getting the impression that I adore this pot? Despite its damage, I think Sue would have no problem getting £400 to £500 in its current state. Roger's cost to restore and reglaze is £400. That might sound steep, but it's got to be a good investment. After restoration, it could easily reach £1,000 at auction. So, Roger, love that pot. Make it whole and make Sue some money! It's operation SOS here at Stonyhurst. So many casualties needing all our restorers' skills to give them a new lease of life. shrouding Edwin's mysterious lady. But has she uncovered any secrets? Well, we're now looking at the beautiful portrait of this Flemish lady. and you will see when I clean this little area just how much dirt is coming off. This dirt is really quite telling for two reasons. and the painting has been in a fire or actually severely damaged by heat. Lucia's teaching me a thing or two. Backs are of equal importance. either having shaved it down or added a secondary support, is quite miraculous. I haven't seen anything like it, to be honest. I rarely get panels that haven't been tampered with. It's rare. It's a once-in-a-career find, but is there more to the lady than meets the eye? when those Charles II chairs go under the hammer? Who will start me at what for these? £2,000 for the pair? It's a restoration bonanza for the crowds here at Stonyhurst. All manner of battered and injured objects keep turning up. I've come across something that I reckon is worth a bob or two. because we've got here quite a pleasant sketch. it's the bean row just around the corner from here. by none other than JRR Tolkien. Yes, the man that gave us The Hobbit and the man who gave us Lord Of The Rings. This was drawn and given to the people he stayed with as a little memento. which if you look around here, is only too evident. sticky masking tape, which has done it no favours whatsoever. The tape has left its gummy mark. so I'm definitely going to have to pass it on to one of our restorers to stop it getting any worse. Speaking of which, hasn't Tim sorted out those Charles II chairs yet? takes its joints apart and dismantles it, the chair's likely to collapse. It's held together by old and new pegs. The originals come out easily. The newer ones need 21st-century technology. What I don't want to do with drilling is go at an angle. If I go to an angle by mistake, I am going to make the hole much bigger. That will weaken the leg of the chair, so you have to be very careful to get your angles right. The next stage is to knock the chair apart. so let's have a go and see what happens. But these chairs conceal some extraordinary secrets. Let's remove that rather cruddy area there. That's a piece of linen. That has been there a long, long time. and stuffed some linen there to pack the hole. Well, I suppose it's a flat pack 17th-century piece of furniture. But a 17th-century flat-pack needs its own specialist assembly tools. Back at his workshop, Tim's ready to tackle that nasty metal bracket. That doesn't want to go anywhere. Let's try another one. at the same time being aware that the wood could splinter. Very stubborn. Let's try something else. It's broken off. It doesn't matter as long as it's below the surface. I can plug those little holes. I won't know until I put the two together whether that's going to be a good fit. Actually, that's a very good fit. I couldn't have asked for better. That will be a very good repair. But carving finials is an extremely delicate operation. Tim's craftsmanship is now being tested. He has to fashion two new finials out of pieces of oak. Steady hands, Tim. Just one slip and it will be start all over again. If we have a look... That is that collar there. Need to dish that in there. It's quite a large chunk of timber to take off there, and that's very narrow. You are putting a lot of stress on that little bit of timber while you're turning that. So let's do that bigger one first. If you actually rest it up against... You can see if you are out in any way. In fact, there's a tiny piece on that edge there, that I need to do a bit more on. Turning the acorn part of the finial is fiendishly tricky. If he's to make them identical, there's no margin for error. -Looking good, so this piece is almost ready to make its debut at auction. Roger's also headed to his studio to tackle the restoration of the Moorcroft vase. Remember, Sue's pot had two pieces that had obviously been chipped off and glued back on. And there's that ugly crack, too. with Moorcroft is getting the paint finish just right. Roger is trying to get an even coat and hide the repair - no mean feat on this type of ceramic. Rather you than me, Roger. Moorcroft doesn't actually lend itself terribly well to conservation because of the colours. To do a coloured filler on Moorcroft can be quite difficult. I'm happy with the join and my filling. to adjust the colour and the glaze. Coming up - will Roger's glaze be a perfect match? Will Sue spot the difference? Lucia has finished working on Edwin's mysterious Flemish lady. Has she been able to give the fair maiden a much-needed facelift? Yes, yes, yes. Completely changed. I can see the detail now, quite clearly. There is much more colour. Lucia has managed to reveal the lady in her true colours. dirty and obscured, but now it does show up. The other thing that came up with taking that sooty dirt off is this lovely little fringe that she's got. You can see how fine those little brush marks are, just outlining her hair. It's very delicately painted. She could well have been done by a respectable artist. Definitely, and I think the quality of the panel reflects that. and having talked about it just recently with him, he thinks it may fetch £2,000 - £3,000 at auction. I'll tell you what, Lucia's done a splendid job on Edwin's paramour. And to think she valued the artwork at £1,000 when he first introduced her. Lucia then cleaned her up for £200. That means if Edwin had the heart to part with his Flemish lady, he could pocket £2,000 - £3,000. She's more than doubled in value. But Edwin's smitten, and as for the lovely lady, she ain't going nowhere but his living-room wall. and a successful Restoration Roadshow with plenty of satisfied customers. Here's a reminder of what tired old heirlooms needed our restorers' skilful touch. is well on its way to making her at least £1,000 at auction. Edwin's alluring Flemish mistress is now worth 2,000 - 3,000, but not enough for him to part with her. As for the Charles II chairs, Tim has sorted out their 300-year-old bodges. Will that be enough to tempt the buyers into spending £1,500 at auction? at Silverwoods auction rooms in Clitheroe near Stonyhurst. The place is filling up with customers eager to investigate the gems on offer. Do remember that auction houses charge fees and commission. But what will she make of it after Roger's expert makeover? Well, shall we do the reveal? -Are you ready? I've been practising this. -Wow, that's incredible, isn't it? That's just amazing. I can't believe that. Now, if you can show me exactly where that restoration's been done, I'll give you a tenner. I just can't see where it is at all. It's just amazing. I've no idea. You keep your tenner. If we got near the £1,000, then you would be a happy bunny? -I would be very happy with that, yes. -All right. Well, so will I.
and produced a breathtaking paint finish. but will Chris and Joanne be bowled over by his skilful craftsmanship? That's amazing. I really can't remember where the join was. -Which is the new finials? You can't tell. It's this one. -You'd never know, would you? -What do you think of those? They're amazing, aren't they? and one was really unstable. But now they have been beautifully restored. Look too good to sell now. so much so, they've decided to put a £1,500 reserve on them. They're just too good to give away. It's the moment of truth, as everyone takes their places for today's fine art sale. -First up are the 17th-century oak chairs. and could now fetch £1,500. Go on, I'll take £1,000. They are well worth that. 700, 800 this time? 800? 800. 900 for the pair together? Come on. Where are those oak buyers? All finished at £800, are you all done at 800? Sorry, folks, I'll have to leave them where they are. Sorry. -It is a bit, isn't it? I agree. I'm disappointed, too. Think how special it is that something so old has survived so well. But at least Chris and Joanne seem philosophical. -They're going back in your hallway, are they? -There's a nice gap waiting for them. So they'll be welcome home. -Next up, Sue's Moorcroft vase. Even with the damage, I thought it was worth £500. Sue paid £400 to have it restored, and I genuinely think it could make at least £1,000. Here we go. Are you holding your breath? I'll start this straight away at £800. 800, and 50 if you like? At £800, and 850? I'll take 850. 850. 900? And 50? 950? At 1,450. Anybody else now? 1,500. -Gentleman hiding at the back, bidding. 1,650. 1,700? And 50 again, now? -Wow, wow, wow, wow, wow! Two one? Two two? Two three? Two three? Two four? Two five? 2,500. Two six? Two seven? Are you all quite sure, at 2,600? Thank you, sir. Do you think that was £400 well spent? I do think it was £400 well spent! It's incredible, isn't it? I can't believe it. It's just amazing. I did say, "Wow, wow, wow,"
and I meant it. Now, to be honest, that's far more than I expected. What a result! £1,000 over its restoration value. To think it was in my garage for all that time! Sue's fantastic windfall proves again that our Restoration Roadshow experts are worth every penny. we've had a very interesting time of it up here in Clitheroe. So until the next time, it's goodbye from everybody on Restoration Roadshow. Led by antiques guru Eric Knowles, a team of expert restorers form a crack squad dedicated to helping the critically wounded items brought to them by the public. But can their remarkable A&E skills save the day and bring those treasured pots, tables, paintings and more back to life? In this instalment from Stonyhurst College, Lancashire, painting conservator Lucia attempts to resuscitate a Flemish lady buried under centuries of grime; furniture restorer Tim Akers uses every weapon in his armoury to revive some 300-year-old battle-scarred chairs; and ceramics expert Roger Hawkins tends to a badly cracked Moorcroft vase that could be worth a fortune.